Fun and age-appropriate activities including ice skating, swimming, outdoor sports, games, arts & crafts. 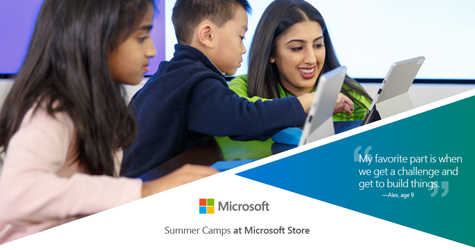 Learn to code and use cool tools directly with Microsoft experts! This camp is free but registration appreciated. Each camp week’s theme helps develop science concepts, guiding campers to greater understanding of science material and its application to the real world. Kids can explore a different science theme at each camp!